As the new Iphone 3G no longer uses the Firewire pins to charge, my existing in-car charger, I used for the ITouch, doesn't work so I had to buy a replacement. I looked on ebay first but even though they were cheap I thought I would look for a well known make for a change after all I'd spent a lot of money on the Iphone. 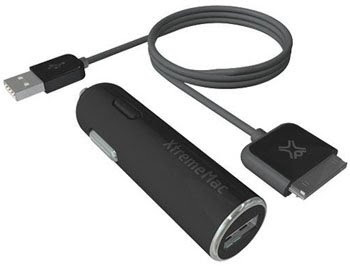 I went into the O2 shop to see what they had and came out with a nice looking xtremeMac car charger for £14.99, it looked good and was nice and slim. I tried it and it charged my Iphone no problem, job done...... or so I thought! The next day I was driving along listening to the radio and I was getting quite a lot of interference which was not normal, I soon realised that the interference was only present whilst the Iphone was charging. On further investigation I proved that the source of the interference was the new charger. I took back the charger and got a refund and I was going to get a Griffin Powerjolt from Carphonewarehouse but as I passed Halfords I noticed they sold the Griffin Powerjolt and it was only £9.99 instead of the £14.99 Carphonewarehouse wanted. The Griffin Powerjolt works a treat and no interference and you even get another USB to mini A cable to add to the collection. I came across this Ipod/Iphone charger the other day in B&Q and after a search on Ebay I found it for £7.99 including postage, BARGAIN! It retails for £19.99 and comes with two Energiser Lithium AA batteries. It uses a fold out connector at the rear that forms the holder for the Ipod. It also acts a a stand for the Ipod/Iphone whilst charging. 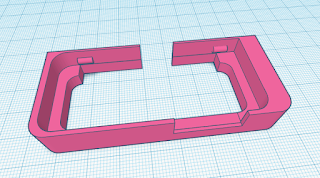 On the bottom it has an adjuster than alters the distance between the connector and the back of the charger so it will fit a nano all the way upto the Iphone 3G and Yes it will charge the 3G Iphone. All in all a very nifty device that will keep you going when you're no where near a mains socket. Having owned an Itouch for nearly a year and absolutely loving it, it seemed a natural progression to go for the Iphone that had all the other options I was missing with the Itouch. So I finally gave in to temptation and bought an Iphone. After about a week the list of things I didn't like about the Iphone grew longer and longer. I think if I'd bought the Iphone straight away all the fantastic things about the interface and usability would have offset all the negative things I keep on finding but as I bought the Itouch first I'm already used to the good things the only extra features are to do with the phone and I really can't believe some of the things that Apple have not done!!! Just to reiterate I really love the ability to browse the web with a good fast browser and I can get my read Ebooks using the large screen, for this alone I wouldn't be without my touch/Phone. As I get to use the phone side of things I'm very disappointed with the lack of effort Apple seem to have put into the phone software functionality, this may be on purpose so we all buy new ones every 12 months when they add features that are already found on most other phones today. No ability to connect my bluetooth headphones, sorry! you can pair them and they are usable for the phone audio but they will not play the music from the ipod, this is absolutely non-sensical. Having browsed the Apple forums this is by design!!! There is basically no easy way to change most of the sounds used for events such as recieving emails - Ringtones require renaming an mp3 file to an mpr and then putting them into the ringtone section of Itunes. SMS tones can not be changed, other than those default ones, unless the Iphone is jailbroken and other SW used. You can not do a lot with bluetooth, like receiving contact information or files from another phone via bluetooth. You can not use the IPhone as a bluetooth Modem, as many if not all other bluetooth modern phones. (You can get around this with a jailbroken Iphone and some jiggery pokery). There are no profiles for the settings of ringtones etc. I use this feature with my Nokia E50 and some 3rd party SW to automatically switch to meeting profile during a calendered meeting. The large very readable screen. The very well thought out browser interface and touch screen concept although I miss being able to make a drawing on the screen with the accuracy I had on My HPHx4700 PDA and a stylus. It's really good a playing music. You can access Iplayer, Video only though. You can't listen to radio 1, 2, 4 etc on the web or Iplayer because the Ipod only supports Quicktime. In a similar vein to 1. you can't watch any of the BBC news videos, this is a pain because if you had a PPC phone you'd be able to see them. For the 3G Iphone Apple removed the ability to charge from the firewire pins on the plug, this means that many of the speaker docks and chargers you've used for the 1st Gen Iphone no longer work ???? My USB charger for the car will not charge the 3G Iphone but the same cable in the Apple charger works fine. I think the problem is that the USB data lines are open circuit on third party chargers and need to be pulled to the 5V supply through some resistors, I'm working on modifying my chargers to work and hopefully I can get my Intempo speaker dock to work with the 3G Iphone.